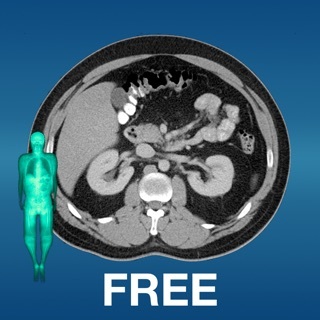 •	Representative radiographic image which can be enlarged for closer inspection. •	Enlargeable photograph of properly positioned human model showing the correctly collimated area of interest with the central ray entry point. •	A helpful NOTE tab for every position; save techniques, special terms, or other helpful information. 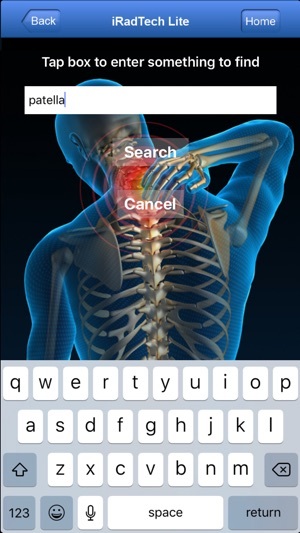 •	Search function finds search term in position titles and/or instructions. 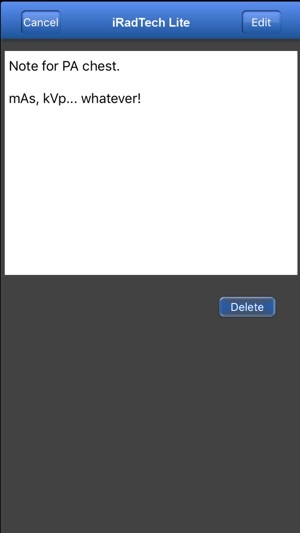 •	My Routines function allows grouping of selected positions into a saved routine. 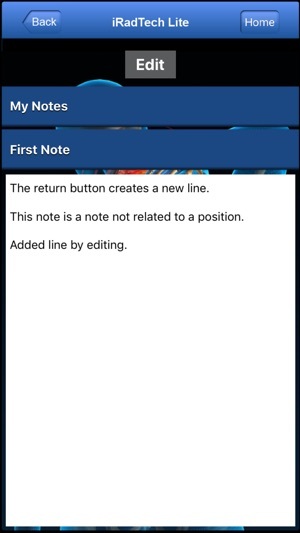 •	My Notes function allows saving notes not related to a position. 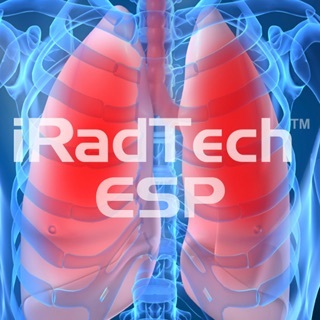 •	Developed using the ARRT Content Specifications to include nearly all ARRT entry-level radiographic positions. 1. 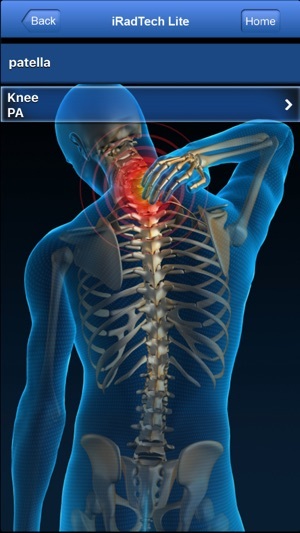 “OPTIONAL” positions are included which may be ordered in clinical practice. 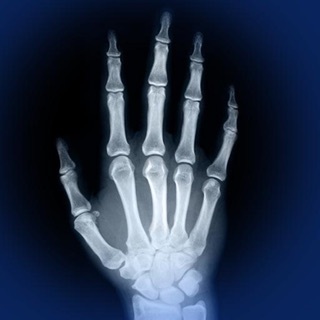 These OPTIONAL positions are judged by the authors and other educational colleagues as handy references, but are not listed on the ARRT Radiography Content. 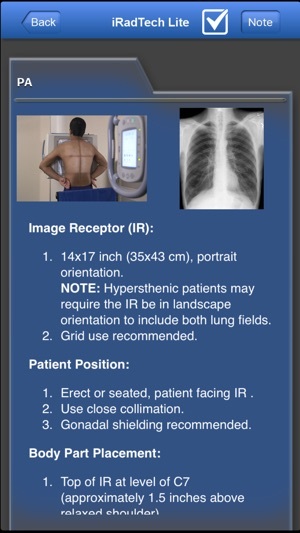 •	Instructions referenced to the most recent ASRT Radiography Curriculum and national positioning texts. 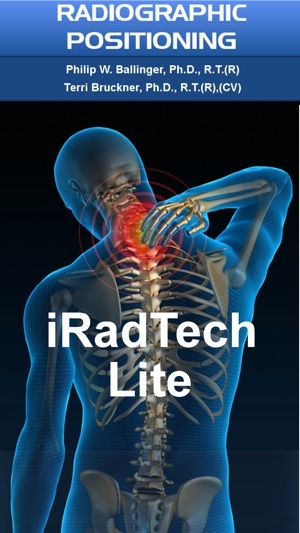 •	Content is written, edited and expanded by two Ph.D. radiography educators, each with extensive authoring experience and more than 30 years of teaching experience. 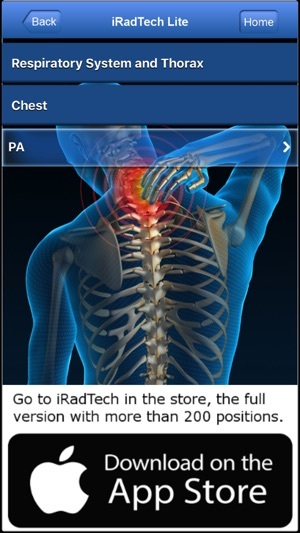 •	A convenient guide to positioning the patient and a valuable study aid for radiography students. 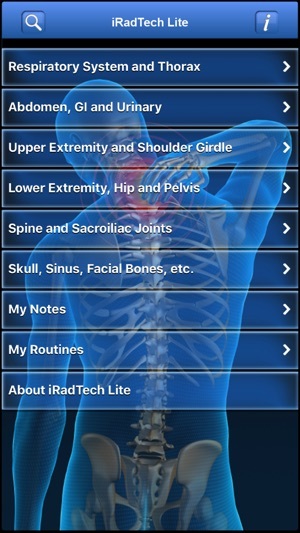 •	A great reference and review tool for technologists and clinical instructors. 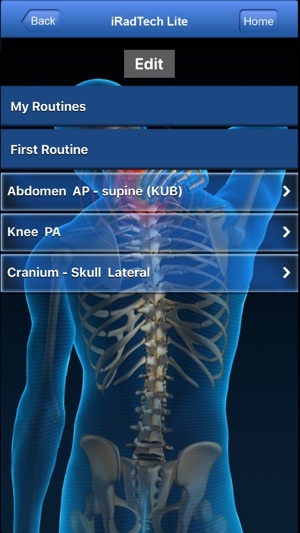 - Reorganized positions with reformatted and augmented instructions in the Respiratory System and Thorax section. Future updates will provide these improvements in other sections. 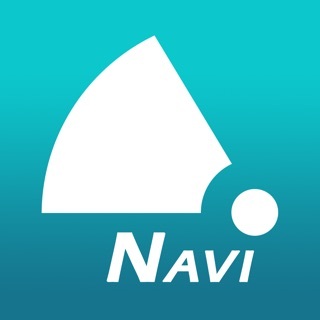 Great App, well worth buying full version. I originally chose the free version, which is basically a trial version without many positions. I purchased the full version, since it is cheaper and much more convenient than a "pocket" positioning guide book and lots better than the "little black book" (older RAD techs & students know what I'm talking about). One complaint I had, and several reviews also stated, were the lack of techniques. There is so much variation between film, CR, DR, different brands, rooms, and preferences, that I can understand the app not supplying these, but I wanted to be able to add some as notes myself. Then, after complaining for a while about this myself, I realized the app already has this! For all of you also complaining, just look under each of the individual positions. There is a blue "Note" tab on the upper right of the page. You can type in whatever you want. I go to several physical locations and deal with lots of different equipment, so under "Note" I add the location or room and an average technique for that exam. You can add whatever notes you want, it is free form. I don't need to look at it often, but it is a great reference to have on hand especially if you are a new tech or deal with lots of different equipment and it is great peace-of-mind to always have with you on your phone if you ever do have a question. Well worth the price! Plzzzz add avg. body habitus techniques(with and without grid)!! That's all that's holding this app back and keeping me from even thinking about buying full version. So techniques, techniques, techniques and I'll give 5 stars and buy full version.